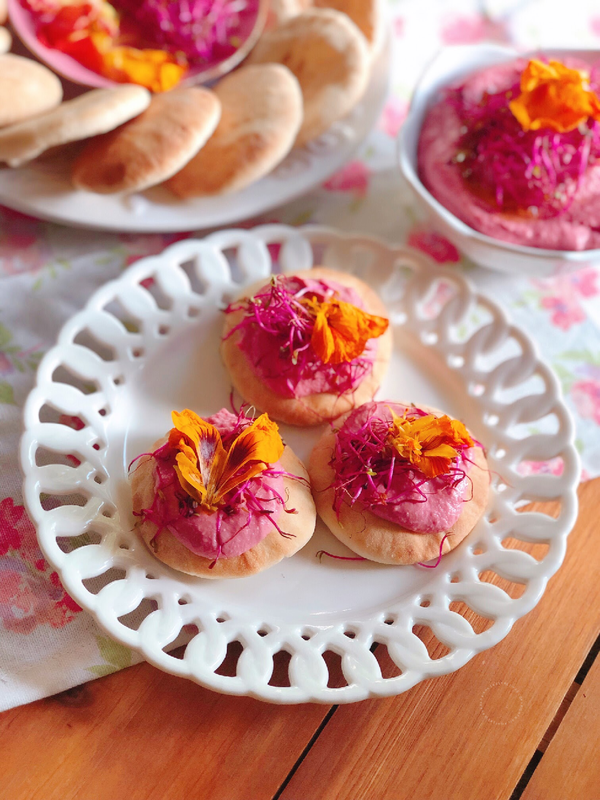 Delightful beet hummus with edible flowers and beet sprouts! Hummus is one of our favorite appetizers and easy snacks to make at home. I have found out that adding produce to the classic hummus recipe makes it even tastier and allows for a variety of flavors. And the result was a super delicious beet hummus! 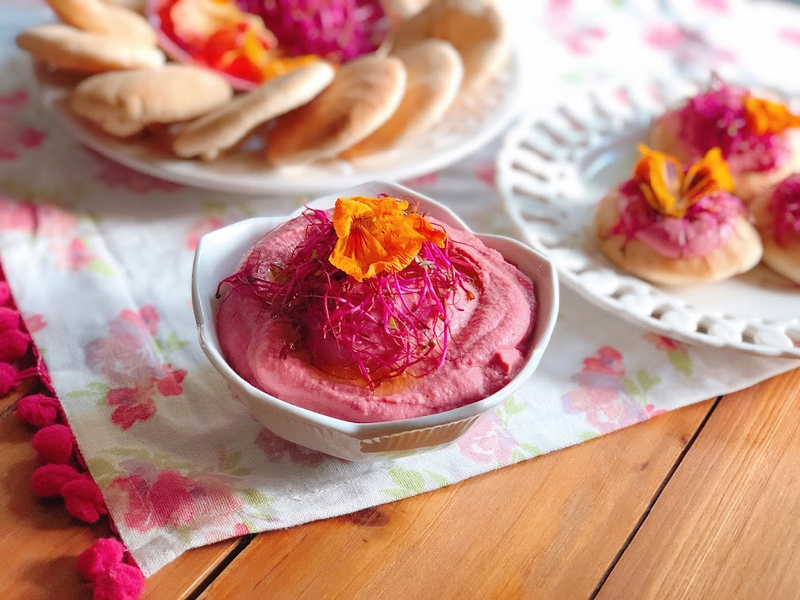 Many people I know do not enjoy beets, but when added to hummus everyone loves them as the combination with the garbanzo beans and the tahini paste takes away the earthiness of the beets while adding a delicate sweet flavor note. 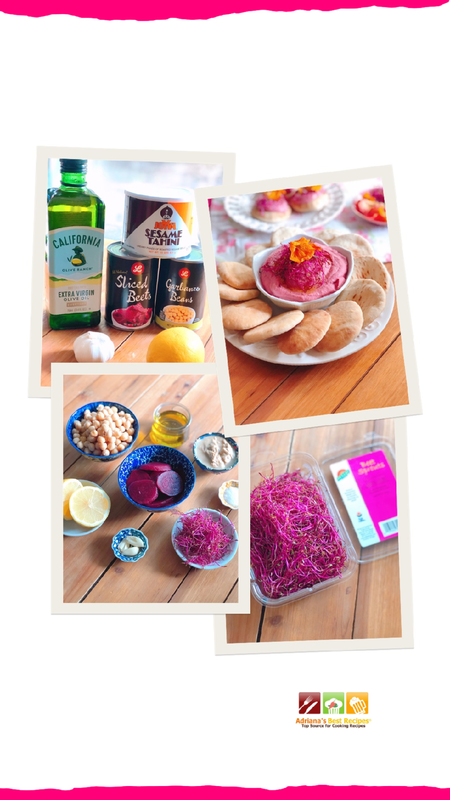 Make the beet hummus at home! 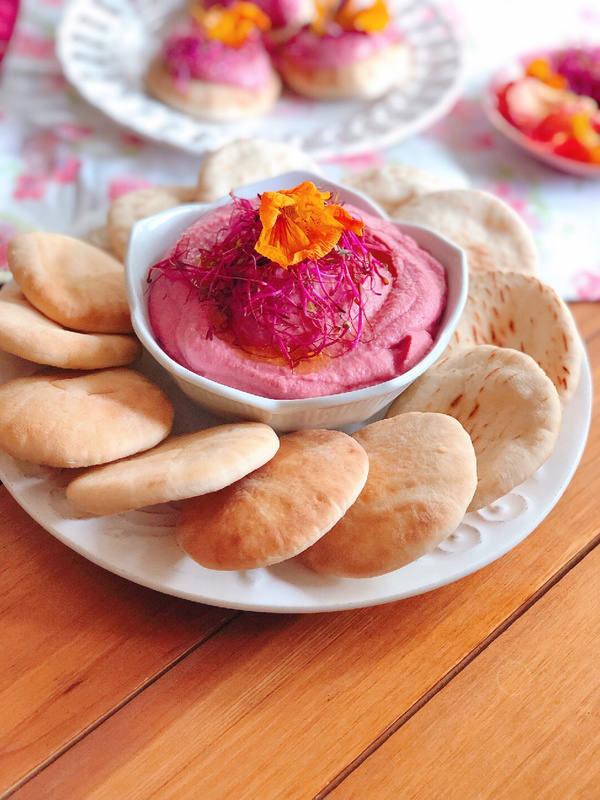 This recipe for the beet hummus is simple to make and done in a few seconds in the blender and served with mini pita bread. And to make the snack perfect, we are garnishing with either fresh from Florida beet sprouts or edible nasturtium flowers. You can also add a drop of olive oil for more taste. Have you ever tried beet sprouts? Beet sprouts are so much fun and add color and taste to the bite. 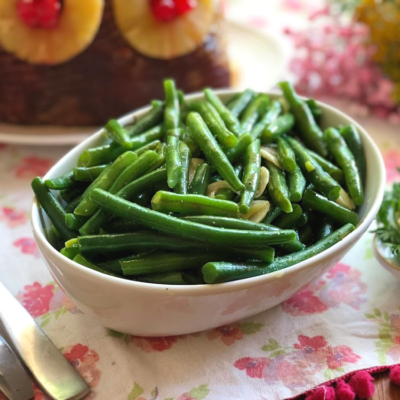 You can use them in sandwiches, salads, appetizers and anything you can think of needs a dash of color and texture. I have never used beet sprouts before, and now I cannot live without them. These little sprouts are surprisingly sweet, and I have used them even on smoothies. These beet sprouts are from a local Florida who sells in major supermarkets. I like to support local farming and every time I see local produce I tend to buy it and test it in my kitchen. Results are always good. 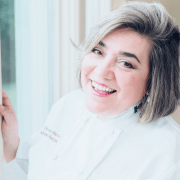 Cooking with fresh ingredients is my secret weapon for yummy meals. The recipe for the beet hummus is a perfect addition to the menu. Everyone will love the subtle beet yummy taste and the lovely color. It has chickpeas, tahini, cooked beets, olive oil, lemon juice, garlic, and spices. Blend all ingredients using a blender or a food processor. Consistency should be luscious and creamy. 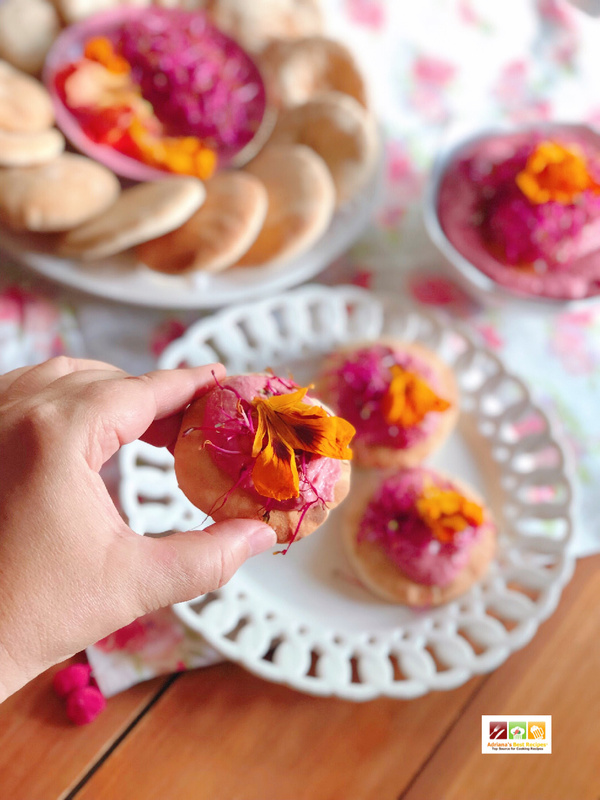 Serve and enjoy with mini pita bread or pita chips. Hummus is a beautiful addition to any celebratory menu. 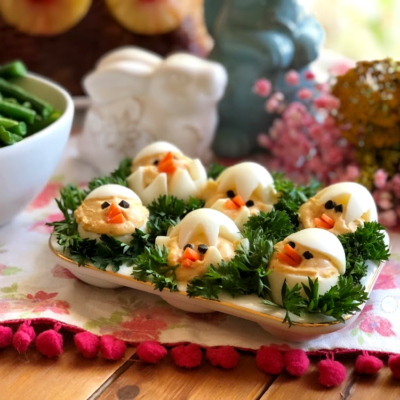 If you are still planning your Easter feast adding a quick and delicious appetizer is a good idea. 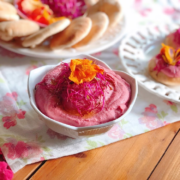 This beet hummus looks ever so delicious and such a gorgeous color too! 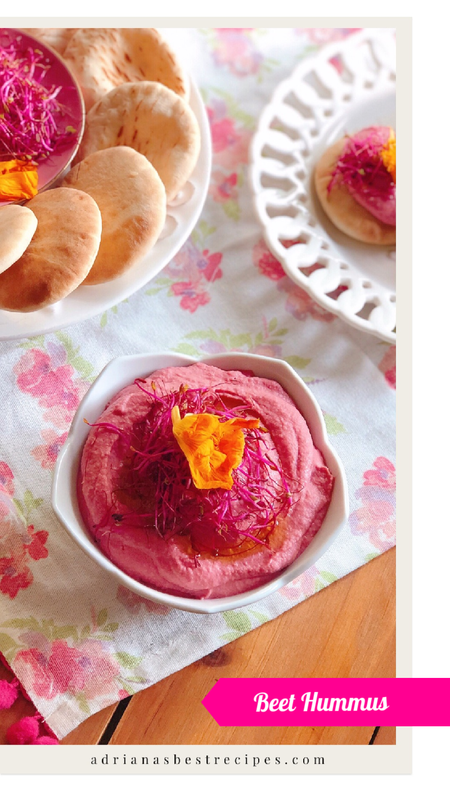 I just love the color beet gives to your hummus! Fabulous! And using beet sprouts and edible flowers makes this plate look so pretty! I’m also sure it tastes wonderful. Can’t wait to try it! I LOVE beets and this looks tasty! I haven’t tried or even seen beet sprouts, but I’m going to keep my eyes out for them. They’re gorgeous!! This is so pretty! 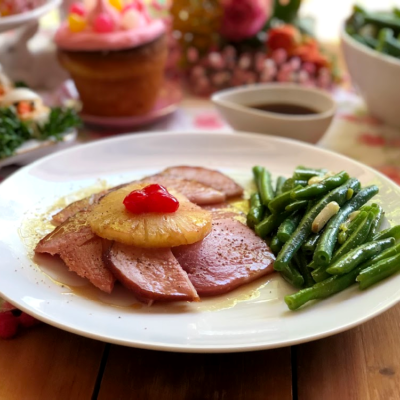 What a delicious addition to the appetizer menu! I made this for a Wedding Shower. Followed the instructions perfectly and it turned out amazing. Everyone loved it! My husband and I LOVE beets! Can’t wait to try this!! 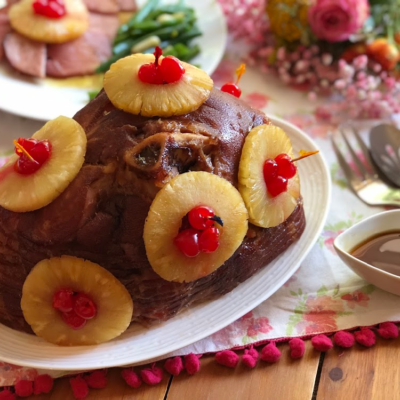 This looks delightful and is so healthy too! What a great dip or snack for after school! 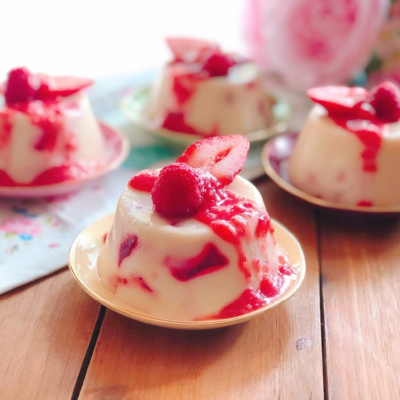 This recipe is so pretty and so tasty! Edible flowers? A-mazing! !